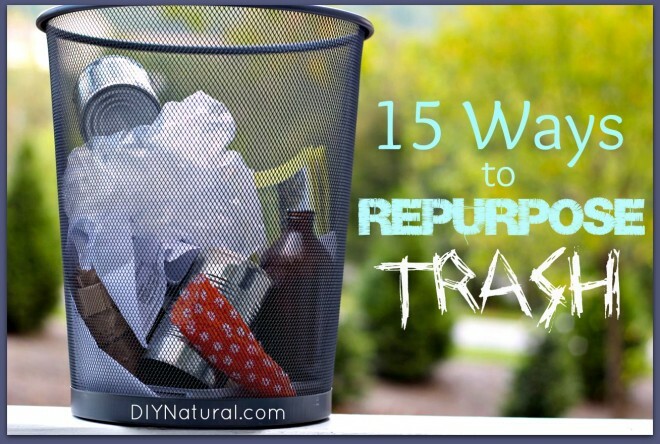 I’m big on recycling, reusing and repurposing. I find ways to use everything I have. As a result, I’ve increased the content in my recycling and composting and cut back on my trash. On average, I’ll have one large bag of trash every two weeks. Cutting down on packaged items is one thing, but finding ways to use what’s normally thrown away is a whole other thing. Here are some of my favorites. From cereal boxes to cardboard boxes, I use them all for storage. I cut cereal boxes in half from top to bottom and turn them on their sides. These are great for holding lids that are so often lost or that are too small for baskets. Milk crates, those made to hold four gallon size jugs, stack neatly in storage. Label the side and you’re good to go. This is one of my favorites. You can grow carrots, turnips and pineapples by using the tops. For root vegetables, soak the top in water a few days until you see roots. Plant as you would any transplant. For pineapples, try this old pineapple farmer trick. Cut the top off a pineapple and remove the flesh. Save this for #4. Peel off the first 2-3 layers of leaves from the bottom. You’ll see small squiggly fibers. These are roots. Take a short glass and fill almost to the top with water. Put your pineapple top in the glass. Be sure the bottom is in contact with the water. Leave in the water for a week or so. You should see roots starting to grow down from the top. If you don’t see roots within 2 weeks, toss it in the compost. Sometimes you get one that won’t work. When you get a nice thick root mass, plant it in a pot. You can leave it outside in the summer, but take it in when the night time temps drop to around 50°. These are a great source of fruit acid. Freeze them and once or twice a week take a piece out. Rub the smooth side all over your face and let the juice sit for 15-30 minutes. Then rinse it off with cool water. The fruit acids act like a mild chemical peel and will soften and smooth your skin. When you’ve done all you can with your scraps, toss them in the blender with a bit of water. Once they are broken into small pieces, toss them in your compost. They’ll biodegrade much faster, giving you a quick compost. I have chickens and two dogs. Between them and the wild birds, I end up with a lot of feed bags. If they are beat up, I use them to hold trash. If they still look good, I donate them to a local woman who makes them into purses and tote bags. I either use these for stuffing if I’m filling something, or I set the smaller pieces out for the birds. They love the bright colors! I love yogurt and usually buy the big tubs. I don’t make my own yet. If I do get the smaller containers, I use them for soap molds. As a soap maker, I look for molds wherever I can. These make a bar that fits nicely in your hand. I don’t have kids, but a lot of my friends do. I use the jars for spices. The wide mouth makes it easy to get a measuring spoon into. When my cotton sheets wear out, I use them for landscaping fabric. It works great for keeping the weeds down and biodegrades in a few years. When I was not aware of the problems related to plastic water bottles, I bought bottled water in bulk. I saved the bottles to do something with later. Now I use them to mix and pour my tinctures and other solutions. I still don’t store them in the bottles, but to mix a batch and pour it is very easy. From newspaper to typing paper, I use it all. Newspaper gets used as a base to cut soap on (with a clean paper over it) and to mix lye on. It can then be thrown out or composted. Typing paper gets used to cut soap on the back side. Here’s one of my best secrets. I work part time in a fabric store. I bring home the shorter cardboard bolts that the fabric comes on. Then I have an old metal rack that chips had been sold on. These bolts fit nicely on the rack and can be set at any interval. I use this for curing my soaps, but it could be used for any kind of storage. If they are in really bad shape, I use the pieces in my fairy gardens. If not, they can be used for desktop storage, especially for pens and pencils. Have you repurposed anything lately? Tell us about your projects. An earthquake in our area made my great-grandmother’s cups go crashing to the floor of our kitchen. I could not bear to throw them out. Instead, I bought a wooden tray at Michael’s hobby shop, arranged the broken china pieces onto the bottom, affixed them to the bottom with tile set paste; filled in around those pieces with small tiles in suitable colors, and I ended up with a nice tray that preserves my great-grandparent’s heritage, and is a useful item, that is also a conversation piece. When ever I print something out, rather than throw the paper away when I am done with it I cut each piece into forths and then staple them together as a scratch pad. All the T.P. rolls, I save them and use them when I get ready to plant seeds. I cut them in half, fill them with soil/compost/planting medium and plant the seed. When they are ready I just take the whole thing and put them in the ground, the paper acts like compost. OR I use them in crafts with the grand kids. They have made dinosaurs, cheetah’s and many other things out of them. Empty toilet rolls and dryer lint. Stuff the rolls with the lint and save. They make great kindling for your winter fires. I am considered to be a cheapskate because I always try to find other uses for different things. We were having a party for 200 guests and I wanted candles on the tables but didn’t want to spend a fortune on candle holders. So what I did, was save all the small cat food tins, cleaned them, then half filled them with coloured plaster of paris. I then decorated the outside of the tins with gift wrapping cord, glued that in place and added a T light candle. Everyone loved them and from the 100 I had made, I only had 16 left over as people took them home with them. I save toilet paper, and paper towel rolls. I stuff them with the lint that I clean out of my dryer. They make great kindling for my fire pit. Love the idea! I’m going to start doing that. Always knew there must be some use for the dryer lint!!! Thanks!! Like Judith, I make firestarters out of paper egg cartons, dryer lint, and leftover candlewax. I also do composting. Last year, I made the kitchen compost bucket you posted on your site. I had to re-glue the filter on, but otherwise it still works fine. I reuse glass jars with lids to store dry goods. With a foodsaver, they can be resealed to keep foods fresh. I also reuse plastic containers. They come in handy when sending leftovers home with company. Great idea for using the leftover sheets. I’ve used mine to make tie-up strips for tomato plants in the garden, grease rags for dirty hands after doing oil changes, cleaning windows, dusting, etc. I’d caution people about putting string/threads out for birds. They love them and use them to make nests, but the colors draw the attention of predators, too. Like the idea of using wet newspapers for landscaping fabric, too. I forgot about some other things I do. I use the smaller yogurt cups for planting seeds for the garden. I also use them for holding paint when doing small projects or to clean paint brushes. I save gallon milk jugs and vinegar bottles to store homemade laundry detergent in. Cereal boxes also make great storage boxes for magazines. Love the pineapple skins idea! I like to use wet newspaper as mulch, weeds never get through it. I save my dryer lint to use as fire starters in the winter when we heat our house with a wood burning stove. I either fill a cardboard egg carton with lint and then pour leftover candle wax over it or stuff toilet paper or paper towel rolls with it, then cut off a 2 inch piece of stuffed roll to use as a starter. I also use old sheets or t-shirts to make “cotton pads” for applying astringent (witch hazel). I cut them into 2 inch strips fold them to make a 3 ply 2×2 inch square, stitch around the edges and you have re-usable cotton pads. Yeah it takes some time but saves tons of money in the long run. I never thought to make my own cotton pads! Great idea, Judith. Well if you’ve ever seen how long (or just google it) it takes for a cotton pad or cotton ball to decompose it should make you think, do I really want to toss this in the trash. Like baby diapers and feminine products, those things are not made to fall apart quickly. I forgot to mention a tip I use. If you have rabbits or other small animals that you feed hay to, keep your toilet paper tubes and stuff them with hay. This keeps the hay contained and prevents the majority of it from falling through the floor wire or getting soiled quickly. They also love chewing on the tubes. I’m lucky enough to get heavy-duty tp tubes at work, and my friends with rabbits are thrilled to get them. Also, a tp tube is great to store an extension cord in – fold the cord in 1/2 a few times and poke one end of the folded up cord through the tube and slide it to the middle of the bundle. Thanks for those tips Patticake! I’ve used the tubes for the cords before, but had forgotten that. I never thought of them as feeding stations though! I’ll have to remember that when I get guinea pigs again. I send out good stuff to the thrift store all the time. I figure if I haven’t seen it in a while and don’t ever use it why not. I also use the thrift store for project items, but I never heard of the sheet one I am really going to have to try this one next season. I cut the large vinegar bottles just the top part and use these for storage and misplaced items. Some times I will decorate the with pretty paper and podge, they work great though. What a great article! Loved the helpful hint re the pineapple skins…given how many I throw away when juicing! Mother Nature has remedies and solutions for everything. Found this serendipitous given around 7 a.m. this morning I posted a message on Face Book about “waste not want not” and it included helpful hints for “re-growing” your kitchen scraps (fruit, veggies)! I collect all cracker, cereal, third class mail, envelopes, etc., any paper product. After pressing them into a five gallon bucket, I fill it with water and let the paper products soak until soggy. This “mess” is placed around my shrubs. Wood chips, pine straw, or whatever ground cover mulch one prefers is then placed on top to hide the wonderful recycled stuff while it decomposes. I live about 70 miles north of the Mexican border and I found a woman who drives a van to a village in Mexico where the people will take almost anything and find a use for it. She asked particularly for craft materials and I asked what the craft theme would be. She said that the people take whatever is donated and figure out a use for it. I cannot go to Mexico with her but I have set aside one room in the house to store materials for her next trip. Paper towel tubes, empty bottles and jars both of glass and plastic, boxes of all sizes and shapes, etc. That’s ingenuity! I wish we had someone like that here. We try to use all we can, but sometimes I just can’t think of anything. Then it get composted or recycled. We rarely throw anything away. We eat pickles, put them in our lunches etc. So I buy them in the big gallon glass jar. The glass jars are great for storing sugar, flour, rice, cereal, anything that a pantry can hold. It keeps out mice, moths, mealy bugs or any other pests. I have also used them over tender seedlings in the garden in spring when there is a frost warning. I love glass. Yes it is heavier than plastic, but I need the workout. Also, it doesn’t absorb odors. I use my gallon jars for storing my herbs when I dry them. I try to buy things in them, but sometimes I have to begging at the neighbors! Hey, so, I am stumped…. I have a tonne of 5ml and 15ml glass Young Living Essential Oil bottles… Got any ideas!??? Hi Bev! I use those little bottles for my own blends. I also use them for homemade lotions that I add essential oils to. I don’t like using plastic when I use essential oils. These are perfect sizes for purses. Thanks Joelle, I use them for my own blends too. I also have some ear drops I make for the dogs that I put in those bottles and a plant vitamin mix (like Superthrive) that I like to have in dropper bottles. We recently started composting & looked online for a container to sit in the kitchen for scraps. We were blown away by how pricey a simple container was. We are instead using an old Maxwell House coffee tub. It’s the perfect size & the flavor lock lid keeps smells inside. Thanks Karen and Matt, too! I just made one of these. I had a bucket but it kept getting fruit flies, so now I don’t have to worry about it.